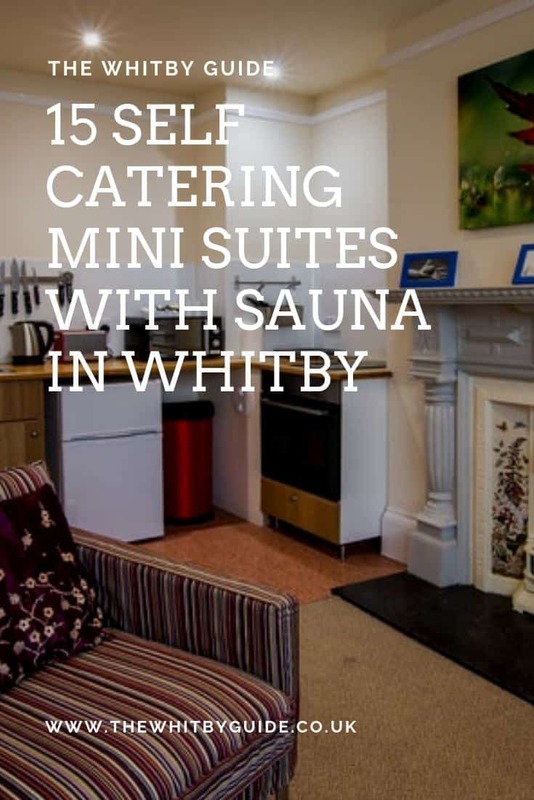 15 Self Catering Mini Suites With Sauna in Whitby. Treat your good self to a delightful mini suite with sauna in Whitby for your next mini break. Treat the Whitby lover in your life to a fabulous mini break in one of these excellent self catering mini suites with sauna. All the facilities are based at the Silver Street address which is conveniently located in the town centre, just a short walk from the main shopping street, Flowergate. You’ll find everything that you need within easy reach from these apartments; tasty restaurants, independent shops, cosy pubs and lots of things to do. Make the most of your next visit to Whitby with a self catering mini suite with sauna. 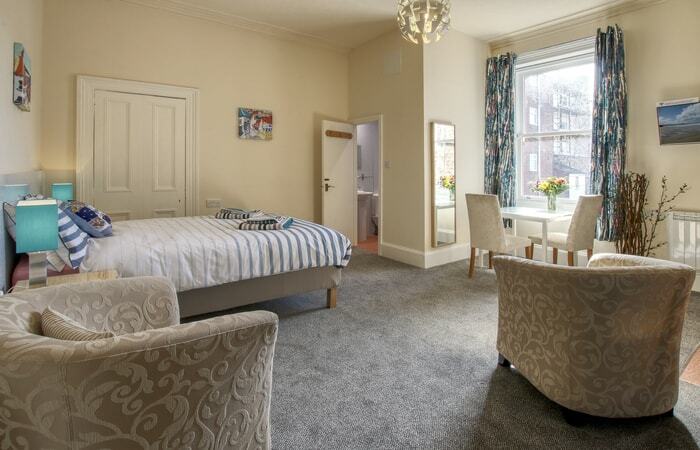 Town House 2 is a mini-suite which makes a great base for anyone staying in Whitby. It is located in South Terrace just a minute away from the breakfast area, pool and sauna and equally close to the seafront and shops. Pets are allowed although owners hope and expect they are well-trained and logically well-behaved. Seabreeze 4 is excellent accommodation on the cliff top in Crescent Avenue which is a short walk from the seafront, the shops and the main office. The mini-suite offers snug lounge, shower, kitchenette and bedroom. Pets are allowed although owners hope and expect they are well-trained and logically well-behaved. 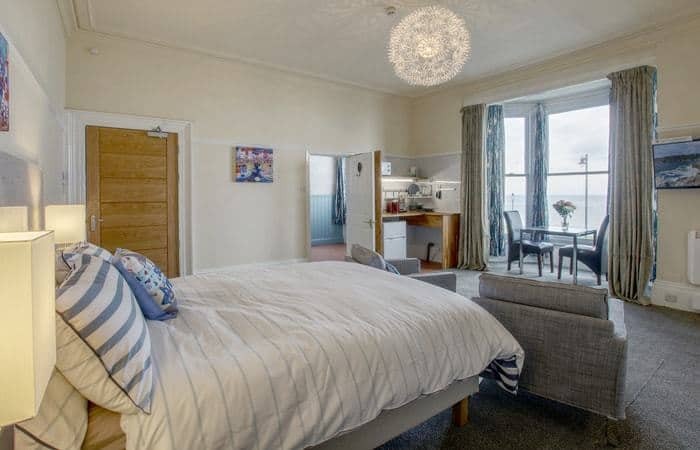 Seabreeze 5 is excellent accommodation with a sea view from the cliff top in Crescent Avenue which is a short walk from the seafront, the shops and the main office. The mini-suite offers snug lounge, shower, kitchenette and bedroom. Pets are allowed although owners hope and expect they are well-trained and logically well-behaved. Seabreeze 6 is excellent accommodation on the cliff top in Crescent Avenue which is a short walk from the seafront, the shops and the main office. The mini-suite offers snug lounge, shower, kitchenette and bedroom. Pets are allowed although owners hope and expect they are well-trained and logically well-behaved. 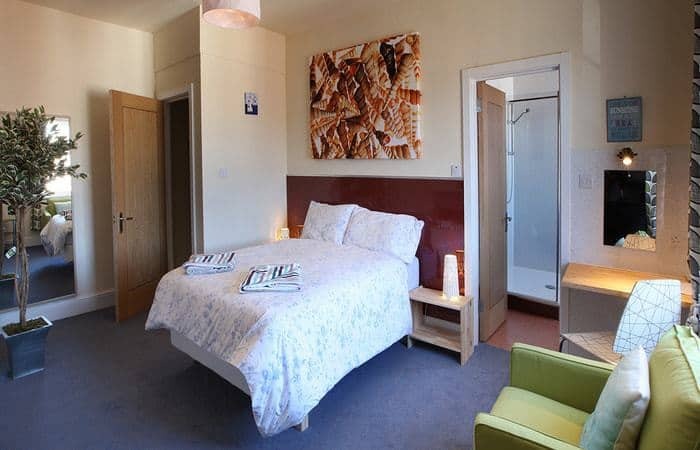 Seabreeze 7 is excellent accommodation with a sea view from the cliff top in Crescent Avenue which is a short walk from the seafront, the shops and the main office. The mini-suite offers snug lounge, shower, kitchenette and bedroom. Pets are allowed although owners hope and expect they are well-trained and logically well-behaved. Seabreeze 8 is excellent accommodation on the cliff top in Crescent Avenue which is a short walk from the seafront, the shops and the main office. The mini-suite offers snug lounge, shower, kitchenette and bedroom. Pets are allowed although owners hope and expect they are well-trained and logically well-behaved. Seabreeze 9 is excellent accommodation with a sea view from the cliff top in Crescent Avenue which is a short walk from the seafront, the shops and the main office. The mini-suite offers snug lounge, shower, kitchenette and bedroom. Pets are allowed although owners hope and expect they are well-trained and logically well-behaved. Seabreeze 10 is excellent accommodation on the cliff top in Crescent Avenue which is a short walk from the seafront, the shops and the main office. The mini-suite offers snug lounge, shower, kitchenette and bedroom. Pets are allowed although owners hope and expect they are well-trained and logically well-behaved. Seabreeze 11 is excellent accommodation with a sea view from the cliff top in Crescent Avenue which is a short walk from the seafront, the shops and the main office. The mini-suite offers snug lounge, shower, kitchenette and bedroom. Pets are allowed although owners hope and expect they are well-trained and logically well-behaved. Seabreeze 12 is excellent accommodation with a sea view from the cliff top in Crescent Avenue which is a short walk from the seafront, the shops and the main office. The mini-suite offers snug lounge, shower, kitchenette and bedroom. Pets are allowed although owners hope and expect they are well-trained and logically well-behaved. Discovery Loft, room 1 is a mini-suite on the 2nd floor on Well Close Square just a two-minute walk from reception, breakfast and the pool is located. It is situated on the 2nd floor. Pets are allowed although owners hope and expect they are well-trained and logically well-behaved. There is parking adjacent to the accommodation. Cockleshell Cabin is a one-bedroom apartment in Silver Street, a great base for a couple. It is wood-panelled and includes a lounge, shower, kitchenette and a bedroom. Reception, breakfast room and swimming pool are on the ground floor below. Pets are allowed although owners hope and expect they are well-trained and logically well-behaved. Captain’s Rest is a modern mini-suite with kitchenette and shower in Silver Street close to the reception, the breakfast room and the pool. Pets are allowed although owners hope and expect they are well-trained and logically well-behaved. Royal 4 is a modern mini-suite double room in Royal Crescent on the seafront, just a five-minute walk from reception, the breakfast room and pool. The accommodation has shower and kitchenette. Pets are allowed although owners hope and expect they are well-trained and logically well-behaved. There is parking adjacent to the accommodation. Royal 6 is a modern mini-suite double room in Royal Crescent on the seafront, just a five-minute walk from reception, the breakfast room and pool. The accommodation is on the third floor and has shower and kitchenette. Pets are allowed although owners hope and expect they are well-trained and logically well-behaved. There is parking adjacent to the accommodation. Royal 8 is a modern mini-suite double room in Royal Crescent on the seafront, just a five-minute walk from reception, the breakfast room and pool. The accommodation has shower and kitchenette. Pets are allowed although owners hope and expect they are well-trained and logically well-behaved. There is parking adjacent to the accommodation. Loving these mini suites? Pin them!